Devon Alexander has been a name that has been floating around the boxing world the last couple of years, however he wasn’t mentioned as often as his 140-pound counterparts. After his impressive win over former champ Juan Urango, the 23-year-old can now expect to take part in major fights in what might be the most talent-rich division in the sport. Urango might not be the quickest boxer, but he definitely has the biggest body of any light welterweight. It still amazes me that the 5-foot-7 Columbian can make weight each time around. He has great power and although he looked tight and a tad reckless during this fight, much of that could attributed to Alexander’s footwork, always catching Juan off guard and off balance. The balance of speed, precision -- and above all, focus -- is what impresses me the most. Urango had only been down once in his entire career (in his last fight against hard hitting Randall Bailey) before entering Saturday’s fight. Those qualities allow Alexander to be entertaining as well -- something his fellow St. Louis native, southpaw Cory Spinks, doesn’t ever seem to be. There are so many opponents to choose for Devon’s first defense, starting with Timothy Bradley, although that's a match that might be hard to make right now, since both are so young. Both have solid chins and great technique. It would be a fight-of-the-year candidate, for sure, but one in which you would see jabs, speed, game plans and skill. A "fight of the year" is rarely that technical, but I would expect this one to be an exception. It would also be a battle of wits, a battle of boxing brains, like chess players predicting their opponent's next move. If it happens, boxing fans who adore the brawls and the brains are in for a treat. There are many options for Alexander, and the talent-wide division seems to be growing by each light welterweight fight. There are three big names who are only 23 (Alexander, Khan, Ortiz), and the majority of name-brand 140-pounders are under 30. These fighters should be around for quite a while, which means big fights are on the horizon for years to come -- and Alexander may be a heavy favourite in each of them. Yesterday was International Women’s Day and although women make accomplishments all year around, many use today to highlight female success. Women’s boxing is scarcely covered, even more so then other sports. The reality is though that many female boxers have had successful careers, and although this type of piece could be used at any point in the year, I will take advantage of this well known day to discuss the best female fighters. Bridgett “Baby Doll” Riley turned pro after a career in kickboxing. The Missouri native was promoted by Don King and was not the female boxer that most would expect. Most would imagine a female fighter who fights courageously through cuts blood to be a tomboy and wear thick checkered flannel shirts. On the contrary, Riley has expressed her love for make-up; however she has also expressed her love for knocking her opponent out. She was also one of the key members in the new sport of women’s boxing. Lucia Rijker was one of the most devastating female power punching boxers of all time. The Dutch women knocked out 14 of her 17 opponents, beating every one of them. She was an undefeated kickboxer as well. Her wins however were more against lesser known opponents and journey women. Nevertheless, Rijker was one of the most feared fighters in women’s boxing history. 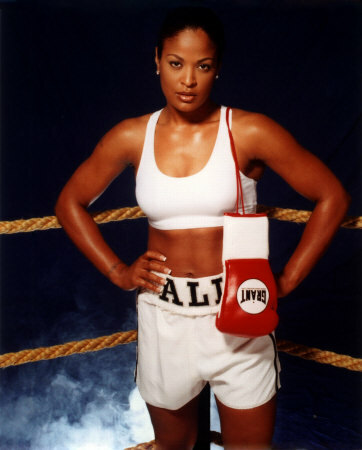 The number one female boxer of all time however in most people’s eyes, is Laila Ali. The daughter of the Greatest of All Time had a daunting stature, but she has been criticized for not fighting the best opponents, such as the 6’6 Vonda Ward who’s only loss was to Ann Wolfe and Ann Wolfe herself. Despite this, many still view her as the “greatest of all time”, when it comes to female boxing that is. Ann Wolfe was an outstanding boxer during her career being able to out-muscle most of her opponents. Her boxing knowledge then transferred to her becoming a trainer, training rising prospect James Kirkland under her wing before he was incarcerated. It has been said that Laila avoided Wolfe as well. For good reason too, especially since Wolfe had destructive power, and the size to match-up with Laila. Regina Halmich dominated the flyweight division during her 13 year career. She was pro before she turned 18 and suffered only one loss during her career, going 54-1-1 (16 KO’s). Her superior boxing skills won her fights, even fight where she hit the canvas. The German native made successful defenses for 12 years straight, retaining her title in 47 consecutive fights. Now that’s impressive. Susi Kentikian may be the best prospect in women’s boxing right now. The Armenian-German is only 22, and is currently holding three titles and is undefeated at 22-0 (16 KO’s). Like Halmich, Kentikian turned pro at the young age of 17, and has the potential to be a major celebrity in German boxing. Her bouts are already televised in Germany, however she is relatively unknown outside her home country. Perhaps that will change if women’s boxing continues to grow. There are numerous others to mention, such as Holly Holm, Christy Martin and even fighters today such as Ina Menzer. Perhaps if we see these women fight more, and on television, then not only can we appreciate the female fighters, but we can appreciate and commend what they are doing. They are boxing.